I do like a good frost (much more so since we installed a heat pump… frosts aren’t quite so nice when your wee farmhouse is so chilly you feel like you’re sleeping inside the fridge). We had a wicked freeze on Tuesday this week. The deck was white with ice, apart from the thawed pawprint patterns from the dogs. The paddocks were powdery. The puddles were iced over. The lawn was wonderfully crunchy underfoot. The rhododendrons along our driveway looked like someone had spraypainted them white. And the metre-high ornamental tobacco plants (Nicotiana mutabilis) in my rose bed were completely coated in ice crystals. Their large, soft leaves had all slumped to the ground. I figured they were a goner… but I was wrong. As the ice thawed, they perked up miraculously. 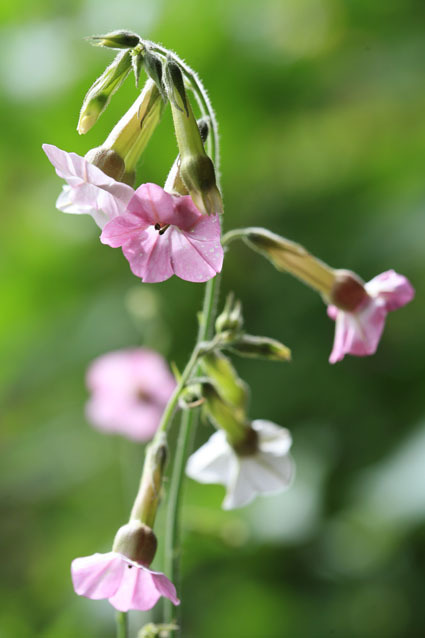 Nicotiana mutabilis is one of my all-time favourite plants. The flowers open pink and fade to white (or do they do that in reverse? I can never remember), which means that at any one time the plants are smothered in tubular flowers that range from pure white to marshmallow pink to bright cerise. (Here’s a pic). You can order it from Marshwood Gardens. HI Lynda – just don’t fall off your deck as you seem to be prone to!! We also had snow here in Waikanae, couldn’t believe it, was at the garden meeting you came to speak at a couple of years ago, and we all looked out our window of our church hall, and blow me down, there were big snow flakes… amazing. You are lucky you don’t have the dreaded camellia blight that we have here – our camellias start off looking great, and then match your brown sluggish ones in a matter of days. Hope Lucas is behaving himselves, has he got his own set of gardening clobber yet? Loved your column in the latest gardener mag.. life has many curious twists and turns, but sounds like yours has turned out perfect. We got out the 30 Seconds this week as the deck is getting a tad slip’n’slide-ish. I saw on the news that it was snowing on Waikanae Beach – amazing! Lucas is behaving himself. Well, for most of the day. He likes to grizzle in the afternoons but we’ll let him get away with it as he usually sleeps for 6-7 hours at night (yay). Hello Lynda, yes we, in usually “Sunny Gisborne”, had a 7deg day with snow all around us on surrounding hills on Monday. At one part we were “trapped in ” as the Whareratas to the south (main highway) had 8″ of snow and snow was still falling. To the west, there was snow on Traffords Hill , which was marginal, and is at the entrance of the Wioeka Gorge. To the North, the road had washed away at onset of a bridge, between Tokomaru Bay and Ruatoria, and we had a 7deg frost. My camillias were ok but my north facing Poinsettia was burnt with the frost. It is a mass of red bracts. — Am off to bed to read my NZ Gardener, which I recieved today. Hope you are having better nights with wee Lucus. Gay Tait. That’s a lot of snow! Hope your poinsettia recovers. My mandevillas are all brown and crunchy so I don’t hold much hope that they’ll spring back to life again. gardener 🙂 Hope you are enjoying your new son, he looks lovely and I look forward to more posts (and lovely photos) from you. We had another frost last night, though not nearly as heavy. The weather’s so beautiful here this weekend. Yesterday Lucas spent the afternoon asleep in his nana’s arms in the lounge, while Jason & I dug a truckload of fresh soil into the stone-edged bed by our house so I could plant: ‘Buttercrunch’ and ‘Tom Thumb’ lettuces, 2 punnets of ‘Perpetual’ spinach (actually a type of silverbeet), 1 punnet of ‘Hybrid No 7’ spinach (such a romantic name! ), a row of carrots, some sugar snap peas and two rows of onions (‘Pukekohe Longkeeper’ and ‘California Early Red’). And today I’m going to ignore my own advice and try to sneak in a bag of seed potatoes. It’s really too early but I can’t wait any longer! Plus I’ve got eight seed trays of lupins, Dutch purple peas, dwarf peas, rocket and beetroot in the little plastic propagating house… all have germinated in the last two weeks. Bring on spring!